Come and meet the team that you could be joining! Come along and have a chat with the senior nursing team, undertake assessments, have an interview and leave with a provisional job offer and the excitement of joining our family! Don't worry if you can't make this date, we can arrange for you to be interviewed on an alternative date. We have lots of great opportunities for experienced and newly qualified nurses in our Temporary Staffing Department. If you are passionate about delivering the best care your patients and are looking for a demanding but highly rewarding role in a supportive and friendly environment, then we are looking for you. If you are interested in working in the Temporary Staffing Department, apply now and we will find the right job for you. 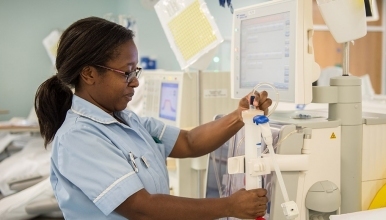 Whilst we would prefer experience in an acute care setting, this can also include student nurse placements. You will have to be able to demonstrate you have experience of working in a multi-disciplinary team in addition to excellent communication skills. You should be able to organise your own workload, as well as taking direction from nursing staff. The Shrewsbury and Telford Hospital is a busy, rewarding environment, with a strong team focus. Please submit an online application, or contact Corinne Smith on telephone 01743 492402 or email corinne.smith2@nhs.net.